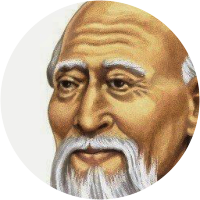 A collection of the best Lao Tzu quotations. A man who is content is rich. That is real which never changes. The wise man knows without traveling. People starve if taxes eat their grain. To perceive things is the gem of intelligence. A man who stands on tiptoe does not stand firm. If nature does not have to insist, why should man? Not to accept destiny is to face death blindfolded. A leader is best when people barely know he exists. Find the great in the small and the many in the few. Which brings more to you . . . .you or what you own? Be still like a mountain and flow like a great river. Those who know do not tell, those who tell do not know. Of all noble qualities, loving compassion is the noblest. The journey of a thousand leagues begins with a single step. The faults of starving people are the faults of their rulers. One who knows others is learned; One who knows himself is wise. Be utterly humble and you shall hold to the foundation of peace. The surest test if a man be sane is if he accepts life whole, as it is. Conquering others requires force. Conquering oneself requires strength. A sensible man is wiser than he knows, while a fool knows more than is wise. A man with outward courage dares to die, one with inward courage dares to live. Manifest plainness - Embrace simplicity - Reduce selfishness - Have few desires. He who overcomes others is strong, but he who overcomes himself is mightier still. The universe is deathless; deathless because, having no finite self, It stays infinite. Governing a large country is like frying a small fish. You spoil it with too much poking. To be good I would be good. To the not-good I would also be good in order to make them good. Rigidity and hardness are companions of death. Softness and tenderness are companions of life. At the center of your being you have the answer;you know who you are and you know what you want. When one no longer thinks of the personal body as self, neither failure nor success can ail him. Wouldst thou know if a society be well governed, if its laws be good or bad? Examine the music it practices. When a man cares he is unafraid, when he is fair he leaves enough for others, when he is humble he can grow. The best captain does not plunge headlong nor is the best soldier a man hot to fight. The greatest victor wins without a battle. Law after law breeds a multitude of thieves. The greater the number of laws and enactments, the more thieves and robbers there will be. Failure is the foundation of success, and the means by which it is achieved. Success is the lurking place of failure; but who can tell when the turning-place will come? I have three precious things which I hold fast and prize. The first is gentleness; the second is frugality; the third is humility, which keeps me from putting myself before others. Be gentle and you can be bold; be frugal and you can be liberal; avoid putting yourself before others and you can become a leader among others.